[page 11] Daughter:	I don't understand it. It sounds terrible but what does it mean? Father: Well. It's not an objective statement, because it is talking about the effect of objectivity — what the poet calls here "thought" — upon the whole person or the whole of life. "Thought" should remain a part of the whole but instead spreads itself and meddles with the rest. Father: Well. It slices everything to bits. Father: Well, the first slice is between the objective thing and the rest. And then inside the creature that's made in the model of the intellect, language and tools, it is natural that purpose will evolve. Tools are for purposes and anything which blocks purpose is a hindrance. The world of the objective creature gets split into "helpful" things and "hindering" things. Daughter: Yes, I see that. [page 16] 10. If consciousness has feedback upon the remainder of mind and if consciousness deals only with a skewed sample of the events of the total mind, then there must exist a systematic (i.e., non-random) difference between the conscious views of self and the world and the true nature of self and the world. Such a difference must distort the processes of adaption. 11. It is suggested that the specific nature of this distortion is such that the cybernetic nature of self and the world tends to be imperceptible to consciousness, insofar as the contents of the "screen" of consciousness are determined by considerations of purpose. Of course, Shakespeare, who got to all the great quotes first, put it aptly when he said, "There are more things in heaven and earth than are dreamt of in your philosophy, Horatio." As someone else said it, "The world is not only stranger than we know, it is stranger than we can know." Knowledge is like a tiny funnel through which we may pass only thin slices of the world about us, and yet somehow we manage to survive even with this severe limitation. One of Gregory Bateson's favorite quotations is from Warren McCulloch, "What is a number than a man may know it? and what is a man that he may know a number?" Warren was invited to the conference, being Gregory's oldest colleague of the group. It was Warren who studied "such problems as how it is possible to reach out for something and had discovered that what appears to be a straight course is actually composed of oscillations, where coordination is continually being corrected for small errors of aim." Later Norbert Wiener gave the name cybernetics to such a study. In this next passage we listen in to the conference as Gregory introduces himself. In this introduction we can learn that he did to culture what his father did to biology, that is, he applied his father's concepts of genetics to culture to help explain how what goes on in the microcosm of interpersonal relationships mirrors what happens in the macrocosm of culture itself. [page 30] "I grew up thirty years obsolete on pre-Mendelian genetics," he began. "My father had been a geneticist before Mendel was rediscovered. Genetics was then the problem of how an organism becomes internally organized and patterned: why, for instance, if you have monstrously two hands on the end of a single arm, those two hands have to be one right and one left, disposed as mirror images of each other, and similar problems of biological regularity. I left zoology and pursued the same problems in New Guinea: how regularity is maintained in a culture, how the internal morphology of a culture is kept in order by the internal dynamics of the relations between persons, and how persons are, in a sense, patterned in their ways of thought and action to fit in with this cultural or social morphology." Somewhere in this massive insight, expressed in a couple of short sentences, lie the answers we must find to dealing with the problems of terrorism in this new century, a terrorism which might be described as maladaptive ways individuals have of relating to foreign cultures they don’t understand, up until now. Obviously this maladaptive behavior happens on both side of the issue, by both the developed and the undeveloped countries, but as experience has shown, a long war between two parties will create an environment in which the two parties will eventually become best friends, if not with the combatants inside the countries, at least with the countries that survive the war. The small segment of the populations of Germany, Italy, and Japan that led their countries into World War II were either killed in the war or scattered to the winds after the war, and these countries have become the best allies of the countries who defeated the evil forces in them during the war. The battle of good and evil is likened in the Bible to the winnowing of wheat, where the good is like the kernels that fall into the basket and the evil is like the chaff that scatters in the wind. What a marvelous way to envision this wonderful thing that is a human being — where our body is the "portion of Soul discerned by the five senses, the chief inlets of Soul in this age." Gregory gave his attention to the first portion of the Blake quote I repeated in the previous sentence, but notice how interesting the latter portion of the quote is, "the chief inlets of Soul in this age." If one studies Rudolf Steiner and his view of evolution, one finds that the physical body of the human being is material in form (mineral in constitution) only in this Earth stage of evolution or 'age,' and our senses as we know them only exist in this age as our means of perceiving that portion of our Soul of which our Body is but the vesture, and a biodegradable one at that. Barry Commoner said that the engineers who developed detergents to replace soap never thought about the ultimate consumer of the product they were developing, namely, bacteria. And what brought them to consider it was the devastating effects the non-biodegradable detergents had on the environment after they went down the drain. (page 43) Gordon Pask talked of biodegradable architecture. As you read his words in the passage below, you can see that he calls self-conscious societies those we consider to be developed countries and un-self-conscious societies those we consider to be undeveloped countries. Biodegradable housing makes me think of adobe huts, thatched roofs, animal-hide tepees, and the housing used by nomads over thousands of years. [page 47] Christopher Alexander makes this distinction in terms of architecture . . . He talks about self-conscious and un-self-conscious societies, saying that an un-self-conscious society makes housing by an essentially homeostatic procedure, which is continually being test as adaptive in the environment. This is a naturalistic system - dump it back on the soil. Now you're pointing out very rightly that the self-conscious society is liable to all sorts of defective control procedures, but, unfortunately, it is also the only thing efficient enough to handle the variety which is perpetually increasing, so that, indeed, one has got to come to terms with self-conscious societies. 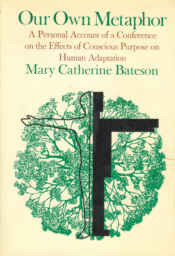 One should not make the mistake of assuming that just because we live in a self-conscious society that we are better off because as Barry Commoner points out on page 56, "we actually are much less well off than the Kalahari Bushmen in relationship to our environment and this relationship will determine our survival." The importance of relationship - which is after all a process, a verb, if you will - was pointed out on page 63 by Anatol "Tolly" Holt who wanted a bumper sticker for his car that said, HELP STAMP OUT NOUNS. He said our fascination with things must be replaced by a fascination with processes if we are to sort out the important relationships in our world. If the engineers who first designed detergents had thought of them, not as a soap replacement, but as a complete process of interfacing with the world, they would have considered the ultimate consumer of the product, bacteria, and would have given the bacteria something it could eat. In the story of detergent design and re-design we can espy the moving from a homeostatic process to a non-homeostatic process back to a homeostatic process. In the evolution of consumer products we've seen a similar move to the production of more and more disposable products followed by a move to biodegradable products combined with recycling to re-establish the lost homeostasis. When you are dealing with processes instead of things, one of the things you must deal with is operators and contexts. In natural language, meaning is context-determined, and contexts can serve as operators, Warren said. Someone asked him for an example and he gave this one. [page 67] "A man meets a girl and he asks her to take off her clothes. If it's a cocktail party, it's a dare; if it's a boudoir, it's the right thing; if it's a streetcar, he's a pervert. The moment you take the context in, it decides how you deal with the rest of it. It behaves as an operator in a strictly formal sense. It doesn't come in as a vague background." Make us dream of all that followed?" [page 90, 91] "If I do not write a letter to my aunt and she writes me an angry letter in reply, what is the 'cause' of her angry letter? The 'cause' of her angry letter is the difference between the letter which I might have written and the letter I didn't write. These are both fictitious; they are not nouns and the difference is not a real object. The moment you start talking about that, over in the future, as the cause of this, in the present, you are passing through this fictional structure. . . . Absences are causes," Gregory amended, "the cause being the difference between what you have and what you desire, not the object of your longing." [page 93] ". . . if you go to war, then you know that guns are better than butter. In peace-time, it's very hard to judge the value of guns as compared with butter, but in war, by God, it's easy. The great relief about going into war is that you know more or less what to do next. you can set up preference scales which make sense because there is one variable in the center of the picture that you want to maximize." [page 169, 170] "It can be shown that the rigid structures in cells, what you might call the nouns of the cell, are very likely secretions of the processes. The orthodox view is that there is structure and it transmits its specificity to process, and yet it's just the other way around." This new way of viewing structure as proceeding from process can help one to understand the world in a wholly new way, e.g., the whole business of how DNA works. Crick says that the 'static specificity' of DNA determines the kinetic specificity. Tolly says that this is an example of the modern orthodox view "that you can see an origin of that which happens only from that which is; that is, structure." The establishment view of science remains in most cases that structure is primary and process proceeds from it. This conference of experts in their disparate fields in 1972 were able to make a case for the opposite view, namely, that process is primary and structure is but an excretion of the process, like the shell of a crab is an excretion of the process of crab-ness, a process which involves multiple cases in the lifetime of a single crab when the crab backs out of its outgrown shell and excretes another one in short order. Barry likens this to the relationship between the ticket for a train ride and the train ride. [page 171] "The ticket has structure, it says you have been from here to here, but the train ride is the process. I would assert that the train ride gives rise to the ticket, whereas the Watson-Crick approach would say the ticket creates the train ride." [page 288] One reason why poetry is important for finding out about the world is because in poetry a set of relationships get mapped onto a level of diversity in us that we don't ordinarily have access to. We bring it out in poetry. We can give to each other in poetry the access to a set of relationships in the other person and in the world that we're not usually conscious of in ourselves. So we need poetry as knowledge about the world and about ourselves, because of this mapping from complexity to complexity. In one of Matherne's Rules #6, I state that "All meanings are true." and I understand that to mean that all meanings are true to the person who holds the meaning. When person A speaks to person B, person A speaks words that chop up A's meaning into thin slices and transmits those thin slices to person B who re-assembles them into something that is meaningful to B. It's as if Fax Machine A were to scan the image in thin slices, scramble the slices and transmit them to Fax B which receives the scrambled information from Fax A with no idea how Fax A scrambled the message and then proceeded to re-scramble the message for Fax B before printing out the result. With such double-scrambling going on, it is no wonder that interpersonal communication is so fraught with error and danger of mis-communication. And yet we can not not communicate — we must attempt to bridge the chasm that divides Person A and Person B, however error-prone it is. In poetry we use metaphor to explain a deep meaning of what otherwise seems to exist only on the surface. Persons A and B both discern a deep meaning in themselves, and while the report each person makes of the meaning will vary, each person may both hold the same deep, but unspeakable meaning. In these times of war when we hear the strains of "God Bless America" - we pause, we sing, we listen to the deep meaning that rises in us, we know that we hold this deep meaning in common with those who share this great land with us in the United States of America, and we know that we have found, "Our Own Metaphor."